I grew up during the peak of Tim Allens acting career. Home Improvement was a family event in my house, and it often featured some really cool cars. I still remember the episode where they dropped a steel girder atop a Chevy Nomad. Im sure it wasnt the real thing, but it was still a shocker. Tim Allen is a car fanatic, and he has a vast collection of vehicles. Now one of his cars, a highly modified Model A hot rod built by Moal Coachbuilders, has shown up on eBay. The "Licorice Streak Special began life as a 1932 Ford. Allen commissioned Moal Coachbuilders for the project, and according to the eBay listing, Not one penny was spared in this build - not one corner was cut. It would cost approximately $400,000-500,000 to replicate this vehicle. This tracknose racer has a 351 SVO engine with GT40 heads pushing out around 400 horsepower, with a T-5 five-speed transmission behind it. However, this car is about more than the engine. The all-aluminum body features numerous one-off features, such as a custom Moal grill and valve covers, brass side moldings, headlamp trim, and trunk handle by Takayuki Kaki Kakizaki. The interior has dark green leather (with aluminum core seats), mohair carpeting, and more brass trim for that truly classic feel. The car has been in Tim's collection for a decade, and has been featured in numerous magazines. It is a cool car with a lot of history behind it already, and someone is sure to get a good deal on this righteous automobile. 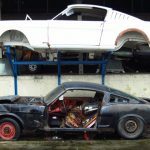 This entry was written by by Chris DeMorro (Stang TV Forums) and posted here on Thursday, September 24th, 2009 at 11:43 am and is filed under Vintage Mustangs. This article was not written by us, rather gathered using RSS feeds listed here. We take no credit for this article. Both comments and pings are currently closed.